Your essay is technically worth ⅓ of your Writing score, but in practical terms it’s worth less than that. That’s because the technical range of possible scores for your essay is 0-12, but most essays fall within a range of 6-10. So all those points that would come from scores 0-6 are basically free points for you, provided you put in the minimal effort needed to score at least a 6. If you’re able to increase your score from an 8 to a 10, say, that’ll append about 40 extra points on your Writing score, assuming your multiple choice score stays the same*. Your score is determined by two independent readers, who are educators at either the high school or university level who have been hired by The College Board. They won’t know each other’s scores, nor will they know your name. They will each assign a grade from 0-6 to your essay (based on this rubric). Those scores are added, and that’s how you get your score on the 12 point scale. If your readers disagree by more than one point (this is unusual), a third grader is called in to settle the score (not someone in third grade, a third person who will adjudicate your essay). It’s important to state, right at the outset, that there’s no one way to write a good essay; there are many paths to a good score. However, I’ve found that the following format produces reliably good results. Sentence 1 is your thesis. Waste no time getting to it! Sentence 2 (if you like) elaborates a bit on your thesis to make it stronger. If you’re going to argue that hard work is necessary for success, for example, then maybe you make your second sentence something about failure stemming from lack of hard work. That way you’ve approached your argument from two different angles. In Sentence 3, mention your examples so your reader knows what’s coming. Sentence 1 is a mini-thesis. Basically, it introduces your example again and relates it directly to your main thesis. The rest of your sentences are a mix of relevant details (if your example is literature, for example, then you need to mention relevant plot points) and gentle reminders to your reader that these details support your thesis. See if you can reference your thesis in some way at least twice in this paragraph. The outline you jot down before you start writing should have at least 3 bullet points for relevant details you want to include about your example. The rest of this paragraph should again be a combination of relevant details and pointers back to the main thesis. If this example is a little shorter than the last one, that’s fine, but make sure you still cram in as much specificity as possible. For some more ruminations about the essay, click here. * Increasing an essay from an 8 to a 10 is no easy task, which is why I like to focus more on the multiple choice section in general…that’s where the big points are. But I digress. I was taught to write the thesis at the end of the paragraph (the last sentence). Is writing the thesis at the beginning of the paragraph(the first sentence) a better way to answer SAT essay prompts? Hi Mary, thanks for commenting! I’m a fan of putting the thesis right at the top because the SAT essay is so constrained by time and space, and I find that doing so forces students to begin their actual essay instead of spending the first few sentences meditating on the definition of a term in the prompt, or trying to say something profound that is beyond the scope of the assignment. To be clear: There are many ways to write a fabulous essay, and you would not be dooming yourself to failure by putting your thesis at the end of the first paragraph. In fact, as you might have noticed, the main idea of many Reading Comp paragraphs comes at the end, not the beginning. Hello, I love your site! Very useful information and am actually looking forward to taking the test to use these strategies! Just was wondering, for the essay section of the SAT is it ok to make up random evidence to defend your points (from thesis)? Such as how you did with the “zombie apocalypse” above? The graders are only judging you for your writing skills, right? Not for “accurate” evidence or correct references to something historical and what not? Hi Kevin—thanks for the kind words! I actually advise against fabricating evidence unless you ABSOLUTELY HAVE TO. It’s true that graders aren’t judging you on the veracity of your claims, but it’s also true that it’s very difficult to come up with a robust enough example off the top of your head in the short time allotted for the essay. the viewpoints opposite to thesis are wrong (essay gives statements which contradict antithesis point of view) + essay has no paragraph dedicated example but few minor statements which resemble examples. S̶o̶m̶e̶t̶i̶m̶e̶s̶ Most of the times my brain gets blank and I am not able to think of any example, how to deal with it?? For reference: I am an average student, got 6 on essay which I wrote on 6th October 2012. 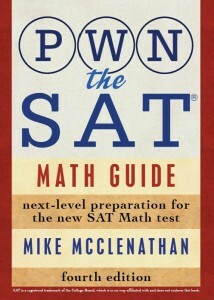 Now I am attempting SAT on 7th December and want to get good score. Please suggest something which I could adhere to. What you’re referring to in your first question is a hypothetical. Hypotheticals don’t actually prove anything—they’re really just your opinion—so they’re fairly weak as thesis support. As I am further going through Essay Guide, I have started to get sense of things. Should students who work very hard in a course earn very high grades, or should achievement rather than effort determine students’ grades? Please list examples with brief explanation taking a position that achievements matter more than mere effort. I think a lot of famous inventors, like Thomas Edison, would work nicely here. They were all hard workers, but they achieved lasting fame, while many other hard workers did not, because of their achievements.